As a former kid’s pastor and education major, I’ve found that there is one thing children inspire in me more than anything else: wonder. Watching children process information through eyes of fascination and awe convicts my “skeptical” adult heart to see things in the same light they do. I believe that when Jesus challenged us to receive the Kingdom of God like little children (Luke 18:17) , He had their wonder-wired nature in mind. It is so easy as we age to lose our wonder–especially when it comes to the things of God. 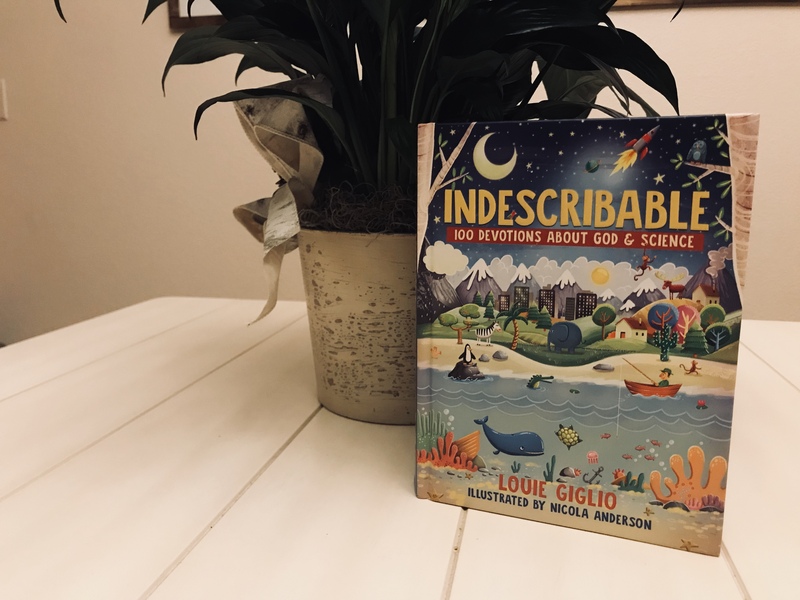 When I was given Louie Giglio’s children’s book, Indescribable: 100 Devotions for Kids about God and Science, the childlike wonder I experienced all those years ago came flooding back. This book was intentionally designed to highlight the extraordinary imagination of God through things in Creation. Each devotion talks about a different aspect of creation ranging from outer space, geology, crazy animals, the human body and so much more. While discussing scientific facts, Louie also ties in common struggles children face and how to view those issues from God’s perspective. Louie does a phenomenal job inspiring wonder and fascination at God’s creation while reminding the readers that this same mighty God cares for us and loves us dearly. Another feature about this devotion that I love so much is the “Be Amazed” sections. These little blurbs give fascinating facts, photos, hands-on challenges, and even prayers that help take the lesson learned in the devotion a step further. Though I am not yet a parent, as an adult, I have learned SO MUCH from this devotional! This book makes for a great bedtime read aloud for younger children and a suitable read-on-your-own devotional for reading age children. In a culture where children can easily feel torn to choose between God and science, this book is a perfect resource that teaches kids that God is the author of science. This book is an amazing tool for Christian families, schools, Children’s pastors and teachers. If you are interested in purchasing this book, you can buy it here! Also, don’t miss the opportunity to WIN this book for free by entering into a giveaway by clicking the picture below!